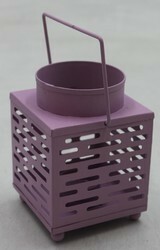 We are offering a wide range of Candle Glass Lantern. Description : Brass Lanterns: This beautiful lantern features contemporary design along with excellent antique finish. We are Manufacturer and Exporters of Stainless steel Metal Lantern with glass, Glass jar. Write us item number for offering our best prices. A yellow, mauve, blue and green glass handcrafted moroccan tin lamp suitable for tea candles or small pillar candles. Use an oil of citronalla candle for your next BBQ and they will provide you with some Moroccan vibes.